I always get stuck for gift ideas don’t you? For years I have been on the hunt for the ‘perfect gift’ for loved ones in my family who trust me are awkward to buy for. Now I have heard of gifts like buying a square foot of land in Scotland so the gift recipient becomes a Lord – yes I did buy this for my husband, well he was my boyfriend at the time, but I’ve never heard of buying a star for someone. Stars are much more romantic and special don’t you think. You can look up at the night sky from anywhere in the world and see the stars. I have always been a sort of star-gazer. As a child I used to pretend they were all tiny little worlds with their lights on. Studying the solar system and space at school was one of my favourite things. Anyway because my husband has his miniscule piece of land in Scotland I decided to give the gift of a star to my daughter. Now she is too young to know what a star is at 13 months old, but I know she will appreciate it when she’s older. 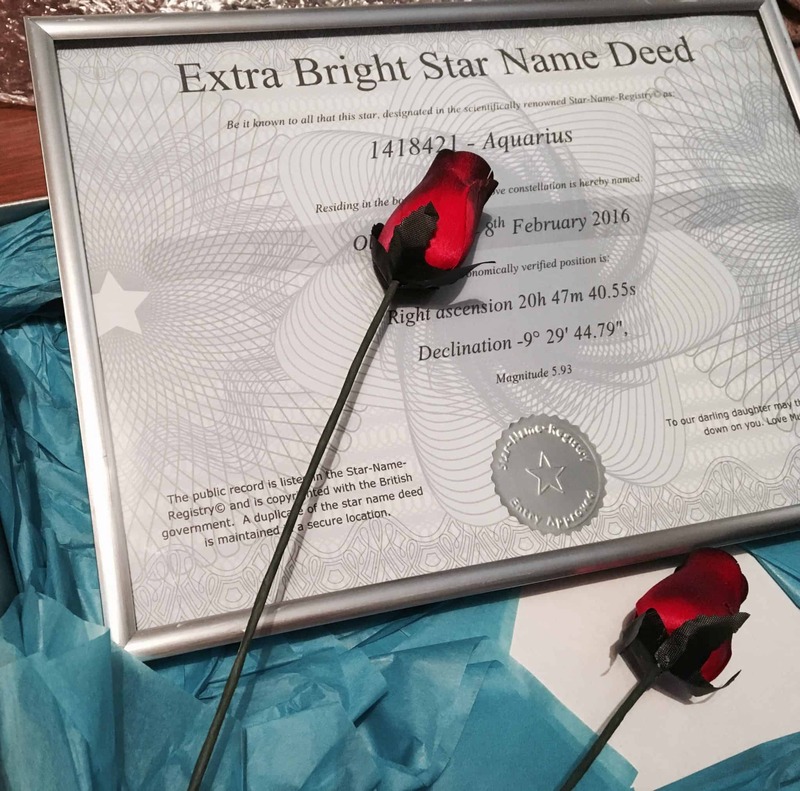 Plus if you need a gift for a baby born in the family, why not name a star in their honour? It would make an exciting gift that will stay with them forever. 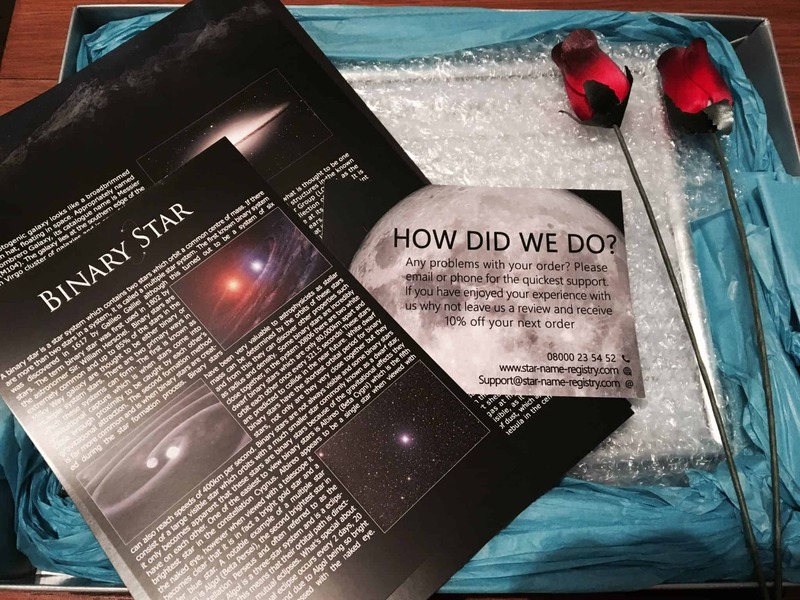 I was excited to receive my name your very own star package from star-name-registry.com who are the UK’s no. 1 online star registry. They will also enter your named star when purchased into the star name registry within 24 hours and no star is never named twice in their star name registry so it will be totally unique! 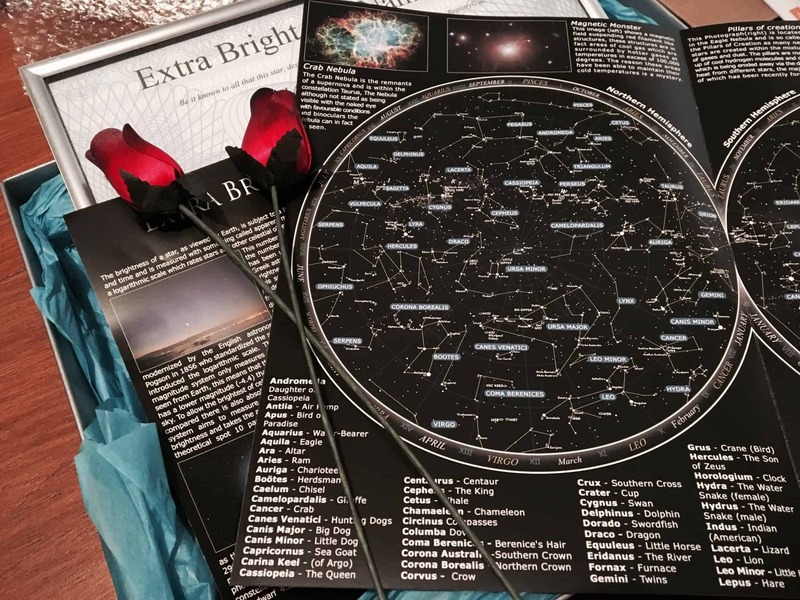 They do all sorts of star name packages to suit all budgets, starting from £14.99 for the standard star up to £69.99 for the Binary Star Gift set. Surrounded by dark blue tissue paper. We received the Extra Bright Star Gift Set which came packaged beautifully. I’m in love with the two wooden roses included, it’s such a wonderful touch. This is an extra you can ask to be included. As well as naming the star you can also choose which constellation you wish the star to be in, this is a lovely touch! Plus you can input the unique reference number located on the certificate to star-register.org and you will be able to see all of the star’s details and a link to Google Sky where you will be able to find your star. Isn’t that fantastic! If you need the star quickly, it can be emailed to you for a charge within 12 hours, but this doesn’t include the gift sets. Next day delivery is also available at an extra cost. Standard delivery is by 1st class Royal Mail and is FREE to all UK orders placed. 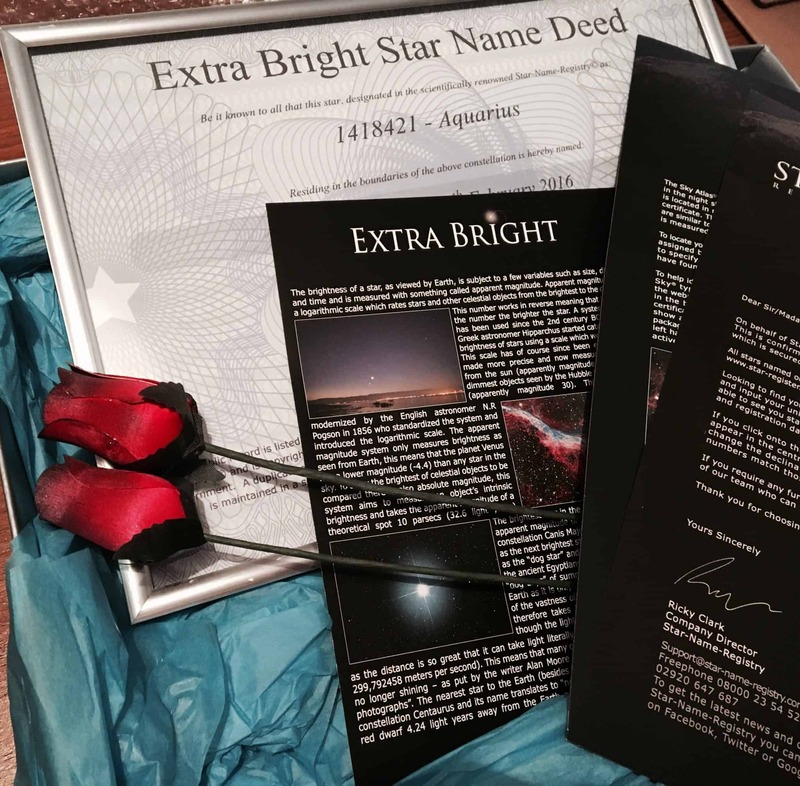 The Bright Star Gift Set is perfect for my baby girl, and the Star Name Deed framed certificate will go up in on her bedroom wall. I can’t wait to explain what it means to her, and I’m sure we will be scouring the night sky looking for her star! *I was given an Extra Bright Star Gift Set in exchange for an honest review. All thoughts and opinions are my own. I would gift this to my nephew who would love it! I would want to keep this for myself and my family and name the star for my dear departed mum. I’d be naughty and keep it for ourselves. We often try to think of a good way to remember the baby we lost in 2010, and this is a beautiful way. My best friend’s little boy. I would gift this to my fabulous sister-in-law Ann. She has everything that she needs and can afford to buy whatever she wants when she wants it. So to me….a broke 40 year old ME/CFS sufferer she is quite difficult to buy for, and I do like to try and surprise her but she is currently battling Motor Neurons Disease (MND/ALS…Stephen Hawking has this in case you are unaware of this condition). You see that it is doubly hard as she cannot move or speak now, so this prize would be fabulous and also give the whole family to look up to and remember her by when she loses her battle with this devastating disease. i’d name it Ari for my niece. I would give it to my mum. I think it’s a wonderful present. I would give it to my eldest little lady, she will be 10 in August and she just loves star watching, she’s also getting a good telescope for her big day too which she’s asked for every Christmas since she was 5. So that will make it extra special. I would give this to my daughter as part of her 18th birthday celebrations this month. I would give this to my mother in law as she is so special to us ???? I would gift it to my niece who would probably name it after a minion. I think this would be great for my daughter Jessica. something quite unique!! I’d gift this to my own little star, my 4 year old son who wants to be an astronaut. My 8yr old daughter Megan would love her to have her own star. I’d give it to my stepson, Will. I suspect he may name the star Ninjago though! My gorgeous little grandson Henry Oliver -Ray he’s my little star ! mmmmm, probably my girlfriend. we like looking up at the stars together, and to say ive named one for her would be a fab gift. I would gift this to my mum, she would love this! I would gift it to my eldest daughter Lauren – I think she would really love it because it’s something different and interesting! I would gift this to my middle daughter Rebecca as she is very interested in stars. This would be an ideal present for her. my daughter Althea could have her own star!!! I would give it to my girlfriend, she’s the brightest part of my life! My beautiful daughter for her first birthday! My granddaughter who is due to be born in June. My Daughter would be amazed! I would name it NEVAEH after my late grandaughter and then present it to her mum . i would gift this to my 15 year old son thomas who would no doubt like to name it after his grandad who passed away last year but they were very very close and i think he would aprciate this as a gift. I’d name a star after my niece and give it to my sister. My nana, who is 90 this year! I’d give this to my Nannie. We would keep this and name the star after my daughter Rowan who was stillborn in September. I think I would give this to my nephew. He’s fascinated by space and would love this. My dad, he loves looking at the stars! I would be selfish and gift it to me! Its been on my bucket list for the past year, I have my heart set on a very special name. Definitely give to my lovely children. My brother Tommy who passed away on Christmas Day ???? I’d love to gift it to my mum so she could name it after her late twin sister! we all miss her terribly. I would give it to my husband so he could name a star after his father who he lost 4 years ago. My dad, so he can dedicate it to my mum. I bought one of these a couple of years back for my Dad, I think they are brilliant so if I won I would give it to my Gran so in a couple of years when she as gone to a better place, we could all look up and see her star shining brightly. id so name a star after me!! My daughter, she would love it. To my mum, because she is fascinated by the cosmos and everything related! I would name it Mr G after my hubby, he would love it and so would I!